WordOfGraceChurch: SHARPEN 2017- What is the Church? 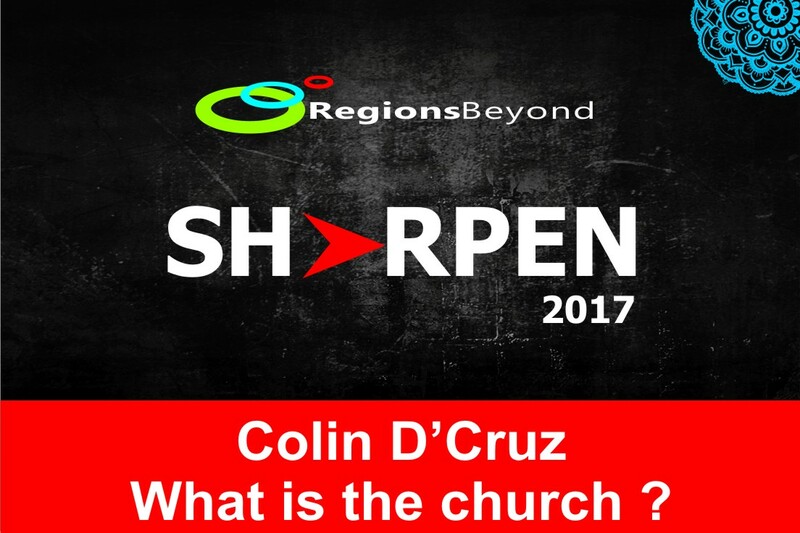 SHARPEN 2017- What is the Church? This message was preached by Colin D'cruz of Word of Grace Church at the Regions Beyond Leaders gathering in India in July 2017. We’re looking forward to these next days together. We are going to share a word and then get into groups for discussion. My topic today is the Church. If you stop someone on the road and ask where is the church? What will they say? They will point you to an old building with a cross. But Church is not a building but people. We need to understand that and use that terminology. In romans 16:5- “send my greetings to Priscilla and Aquilla and the church that meets at their house”. Today we have churches on the internet. You put your computer on at the service timing and give your offering online all over the world. Although church is not a building but a people, they need to be in right relationship with God and with one another. In Matthew, Jesus says he will build his church. It is His church. Jesus asks his disciples who people thought he was. They replied, you are the Christ the son of the living God. Jesus replied that this is revealed this to you by my Father who is in heaven. He was building his church on the confession of Peter that Jesus was the son of God. There is a church called the universal church which is made up of all Christians of all time. That’s the universal church. If you are a true believer, you are a part of that church. Then there is a local church which meets in an area. Matthew 18:17- when Jesus was talking about discipline- “If they still refuse to listen, tell it to the church”. Which church is this? It’s the local church. In the local church you may have people who are not believers. Many times, people in the world look down on the church. When someone says, I’m working for the church, the reaction is… poor guy, he couldn’t do anything else. But in Eph 5:25- “ husbands love your wives just as Christ died for the church and gave himself up for her”. Not only did Christ die for the church, but he calls her His bride. In revelation 19:7- the marriage feast is ready. And the bride is there. You are the bride of Christ. Some women feel weird about being the son of God. In the same way, we men are a part of the Bride of Christ. The Church is not just the Bride, but the body of Christ. 1 Cor 12 speaks about us being members of Christ’s body. 100 years ago, there were great corporations, many of which are no more. The big corporations today will not be there after a few years, but the church of Jesus will survive forever. It is a great honour to be a part of the church. It is a privilege to serve and lead the church of God. So we need to be careful how to treat one another. 5. Added to the number that day. This is the kind of church that Jesus is building. Unbelievers are welcome to attend a church meeting, but they are not members. Don’t make them elders or deacons. 2. Fellowship- it is not just coffee and cake after the meeting. It is relationship. It is caring, loving, accountable relationship. Acts 2:44 talks about unity- they had all things in common. They met daily. They loved to meet together. Church is one that is united working towards the common goal in God. Peter spoke about being a spiritual house making spiritual sacrifices. We gather around the presence of God. A Vibrant healthy church needs to be a healthy church. Sometimes we see magnificent church buildings and 15 people in the building, with an average age of 70 years old. We need to have a growing church. Q. Is it a democracy? Phil 1:1- If you are a true believer, you are a saint. But not only are they saints, but there are deacons who have responsibility in a specific way and elders who manage the affairs of the church. For healthy churches, we need saints, deacons and elders. Acts 14:23- Paul and the others had gone to different cities and preached. But that was not the end of their job. “Paul and Barnabas appointed elders[a] for them in each church and, with prayer and fasting, committed them to the Lord, in whom they had put their trust.” Then their job was done. In addition to elders, we have the Ephesians 4 ministries- We might not have these in every church, but we can draw on translocal ministries to have evangelists etc, work with us. V. What are we are called to do? Heb 13 talks about having to give an account for the people we shepherd. There is a reward for it. So, how can we bring people to maturity? That is what Ephesians 4 speaks about. We build people in the church, but also equip them to go out and live in the world. · We are effecting society like salt and light. If it wasn’t for William Carey, none of the women in India would be educated. That’s the effect of the gospel. 2. Communion- Is a continuation of church membership. · We are called to be multigenerational churches, multi- ethnic, cut across class and caste. Jesus is coming back for His church. Maybe you are 20-30 people. And sometimes its hard going. Last week we got a message about this pastor in Punjab who was shot, the church is not the highest playing employer in the world, the burdens of people, and sometimes you may ask… is it worth it? But the hope of the world is the church of Jesus Christ. No government or company can solve the basic problem of humanity which is sin. Whether you are serving 1 person or 100 people, it makes a difference. It can be overwhelming. It’s like the story of the starfish and the beach. A man was walking on a seashore filled with starfish which are dying on the shore. So he picks up one after another and throws them back into the sea. Another man tell him, you can’t save the starfish like this. It won’t make a difference. He held up the next starfish threw it into the sea and said, it made a difference for that one. As we are touching even one person, it will make a difference. The church is the only thing that will go into eternity. Let’s work together and build strong churches!